Unfortunately the weather forecast is not improving and rain is very likely this afternoon & early evening so we are officially postponing tonight’s Burning Scarecrow event*. 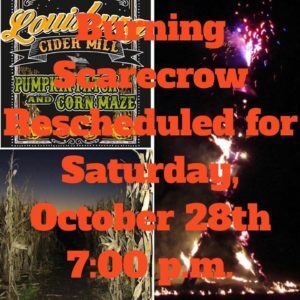 The event will now take place next Saturday, October 28th at 7:00 p.m. We will light the Scarecrow at 7:30 p.m. SHARP! *NOTE: Even though we have made the choice to reschedule the event, we will still remain open the remainder of the day! Cider Mill & Country Store are open until 6pm and Pumpkin Patch and Corn Maze are open until 10pm. We will only close the Patch & Corn Maze if the thunderstorm conditions become unsafe for customers and staff (lightening, heavy rains, etc.) We will continue to operate through a light rain.